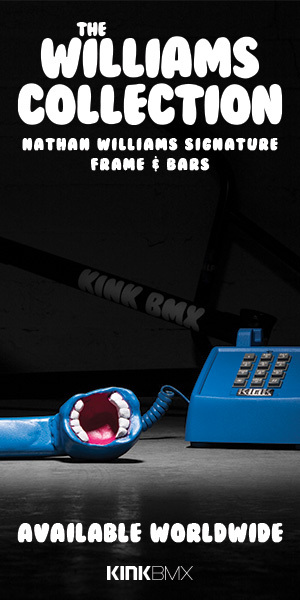 Thinking about picking up a new BMX frame, but you’re looking for something that will stand out? Take a look at the new Creature Frame from Fiction BMX. This street and park frame is made from full straight gauge 4130 chromoly tubing with a 75-degree head tube angle, 71-degree seat tube angle, 11.8″ bottom bracket height, 9.50″ standover height and a 12.75″ – 13.40″ chainstay length. You can find a heat-treated integrated head tube, laser cut gussets on the top and down tubes, an integrated seat post clamp, heat-treated Mid bottom bracket, curved stays for 2.40″ tire clearance, heat-treated 14mm dropouts and removable brake mounts on the seat say. The Creature frame from Fiction is available in this Angry Sea Blue (blue / white splatter) and translucent Black Lagoon, top tube lengths of 20.75″ and 21″ with a weight of 5 lbs. 1.90 oz. Even better? You can pick up this frame for $229.99 through BMX shops and mail-orders that carry Fiction BMX worldwide, or direct from the Fiction Website. Note: This frame will be available November 27th, 2017. You can pre-order now, though. How rad is that Angry Sea Blue color? A detailed look at the head tube. Digging the Angry Sea Blue color? You can get a whole kit with the same color. The Fiction Monkey 4-piece and Troop 2-piece bars, and the Troop fork all come in the same color. What do you think of the new Creature frame from Fiction BMX? Are you digging that crazy color or not so much? Let us know in the comments!